The Next Generation Operational Control System or OCX is years behind schedule and will end up some $1.1 billion dollars over its original $886 million baseline budget, according to the Government Accountability Office (GAO). Citing cost estimates from the Defense Contract Management Agency, GAO wrote that the final contract cost for building OCX could balloon to over $2.15 billion before the program is completed. Exactly when it will be finished remains a question, the performance audit said. An advisory independent review launched in October 2014 determined that the Block 1 OCX software would most likely be delivered in November 2020 — two years later than an estimate made that summer by the Air Force when it recast the baseline budget and schedule to reflect slippages. Both the Air Force and prime contractor Raytheon were consistently over-optimistic in their scheduling and cost estimates, GAO examiners found, adding that military managers did not fully reveal problems to senior Pentagon officials. In fact, GAO asserted, senior defense acquisition officials may not have sufficient insight into the program to accurately judge its progress. The foundation of the current problems was set, the report emphasized, when the Air Force decided to proceed with the OCX contract despite not fully understanding its requirements and complexity. In one example of the unexpected twists, both the company and program officials told investigators that Raytheon had anticipated having certain information assurance (cybersecurity) requirements waived — as they previously had been for other programs. However, given the potential consequences of cyber attacks on the GPS ground control system, those waivers were never granted. The Air Force also made repeated changes to the work as it was ongoing, updating the specifications for OCX’s connections to other government systems, for example, as well as its M-code signal requirements. Raytheon officials estimated that, as a result of various modifications “nearly two-thirds of the requirements baseline as of [preliminary design review] had changed by mid-2012,” according to the GAO. Those changes rippled through the coding process, requiring updates and modifications of software being developed using a more organic and commercial development approach where software is developed in iterations and blocks instead of the traditional, linear “waterfall” approach where the system is fully designed before coding, then coded, then tested. Those changes in requirements contributed greatly to a persistently high defect rate in the OCX software. “If you have requirements change at the same time you’re developing the software, it’s more likely that you could have a higher amount of defects that you have to change after the fact,” said Matthew Gilligan, Raytheon’s vice president for navigation and environmental solutions. The program is now in the midst of another review, said Gilligan, and Raytheon and the Air Force are settling on their approach. The team is closing out the critical design review for the next iteration of software this month and is working with its military officials to set a new budget and schedule. “With a solid requirements baseline we’re confident we (won’t) have the kind of requirement volatility that we saw in the previous iteration of the software,” Gilligan added. As a result, he added the number of software defects should drop significantly. For its part the Air Force broadly agreed with GAO recommendations that it put in place independent experts to help it stay on top of the program, noting that those recommendations largely had been implemented. Although GPS III satellites could still be launched beginning in 2017, “they would not be added to the constellation until OCX comes on line or until a contingency operational control capability able to command GPS III satellites is available,” GAO said. The Air Force is already working to put such a contingency capability in place, the GAO noted, though it will require funding and other resources. 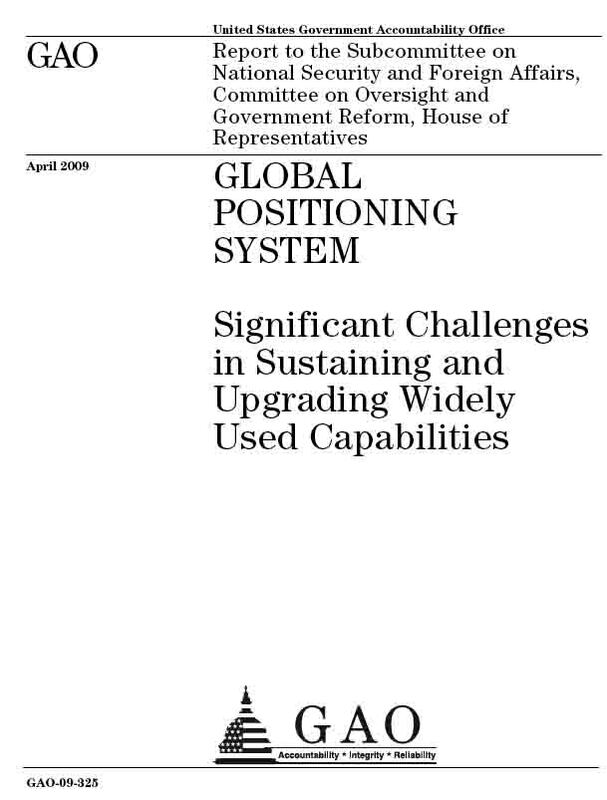 The service plans to update the current ground system to operate the GPS III satellites, but only at the level of functionality a GPS IIF spacecraft.